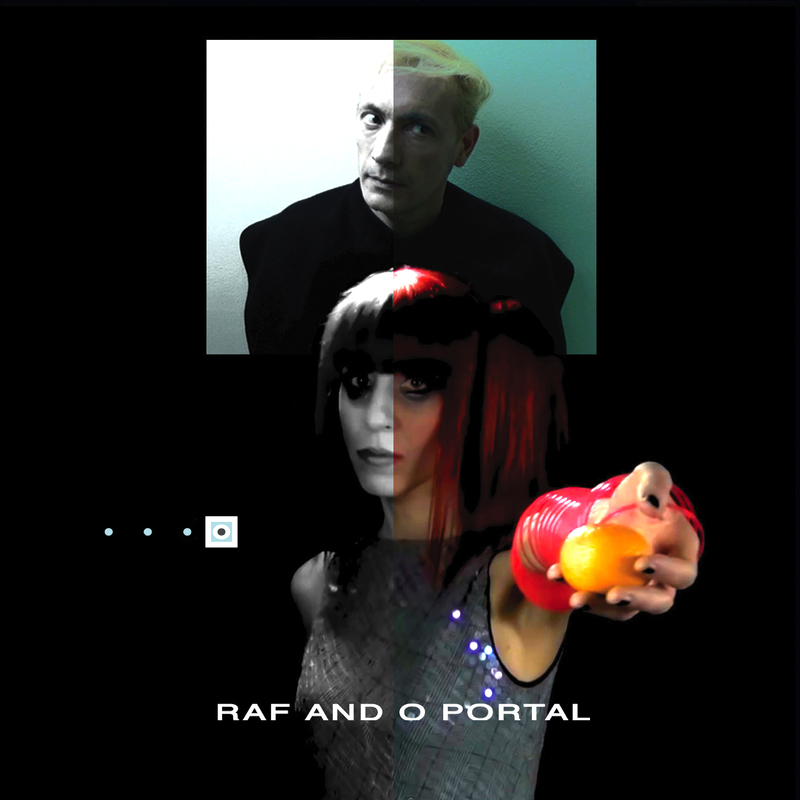 Raf and O’s new album ‘PORTAL‘ on Telephone Records is OUT NOW!! Available on CD and Digital via Bandcamp, iTunes and all good digital stores. 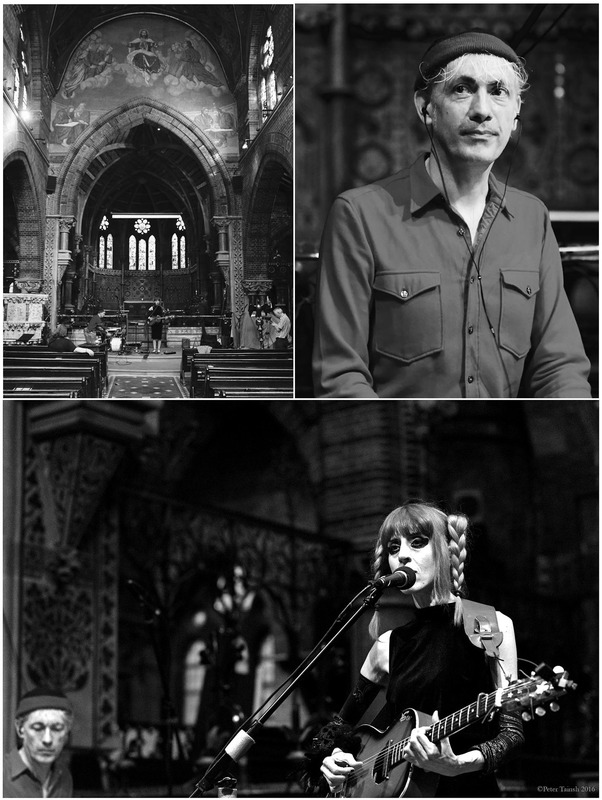 The Launch at St James The less was a wonderful experience …. performing the album in its entirety, we were able to make the journey. Tons of thanks to the brilliant Klarita Kaparte for promoting a splendid night, Robert Logan for being the ‘special’ special guest and for his excellent set, Alan Pride for tons of support, thanks to the wonderful audience for being part of the journey, for the photos, the footage and for getting the album.The Portal leads somewhere …. In January we were all shaken by the news of David Bowie’s passing . Now that we had time to adjust, cannot think of a better way to honour him this summer than to return and join the line up for the Beckenham Bandstand renamed the Bowie Bandstand. The festival is and has always been in our hearts. Originally organised by Bowie and his friends from the Beckenham Arts Lab, The UK’s first Free Festival was on 16 August, 47 years ago and it coincided with the release of his first hit single Space Oddity. This Saturday, 13th August, we will all be celebrating him, the legacy of the Beckenham Arts lab and help to raise funds again at Bowie’s Beckenham Oddity AKA Memory of A Free Festival. The line up comprises of Malcolm Doherty, Daphne Guinness, Maggi Ronson, Raf and O, Phillip Rambow, Jona Lewie, Then Jerico, Amory Kane, Boe Huntress and a few others! Mary Finnigan who originally organised the festival with David, will be signing copies of her recently published book Psychedelic Suburbia and we’re honoured to have a mention “Most impressive were Raf and O, a talented avant-garde duo influenced by David Bowie but no copycat.” Mary Finnigan, Psychedelic Suburbia. The event organiser Wendy Faulkner says “After the devastating news of David’s death in January we felt we had to do a tribute for him — and there’s no more fitting place to do this than the bandstand where he played in 1969”. The Bowie Archive has donated another item signed by him plus other items will be available at the auction. Generously supported by DavidBowie.com , Tony Visconti and Iggy Pop. The festival starts at 1pm, Croydon Road Recreation Ground, Beckenham. 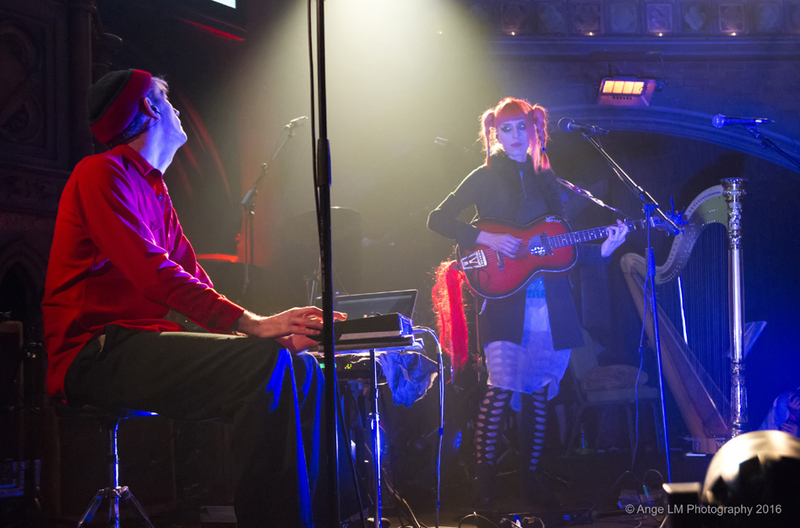 Raf and O live at Starman, a celebration of David Bowie, Union Chapel. Photo taken by Ange LM Photography. Two months into 2016, it’s time for a blog. It seems respectful to start with Bowie. David Bowie, fell off our Earth on January 10th and the Earth was mourning. It was all so sudden two days after the release of his brilliant new album, he was gone, leaving us with Blackstar, an outstanding piece of work, daring and unafraid, revealing more than its fair share of brilliancy and courage in the aftermath of his death. Later, O and I went to Beckenham, we laid flowers on the bandstand, everything was flickering as clouds raced across greying skies. 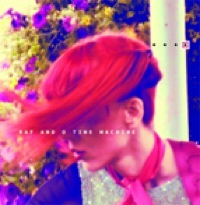 Those who have been following us know that Raf and O, a few years ago had been reworking Bowie’ s Lady Grinning Soul, included in our album ‘Time Machine’, celebrating our long-standing love for Bowie alongside our original material. We performed it at Memory Of A Free Festival (MOAFF) on the bandstand and received praise from the wonderful Mike Garson and David Bowie Official. 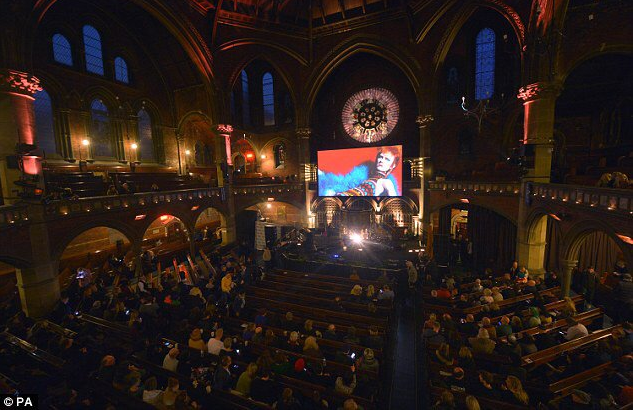 A week after his passing, we celebrated the Starman at the stunning Union Chapel, performing before an audience unified, together alongside many other artists including the Magic Numbers and David McAlmont. It was an honour tinged with great sadness. The event was broadcasted live. 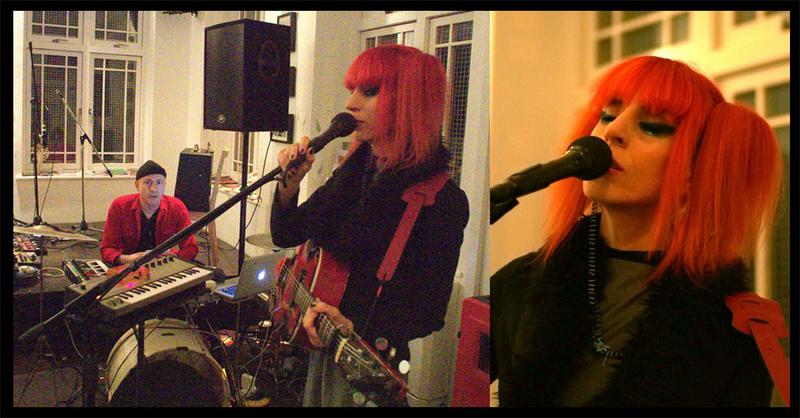 More photos of our performance can be found HERE courtesy of Ange LM photography. And Garson just returned to the UK to pay tribute to David with Lorde and his old band, a beautiful surprise. I was recently asked to describe my feelings on Bowie’s legacy and his passing. 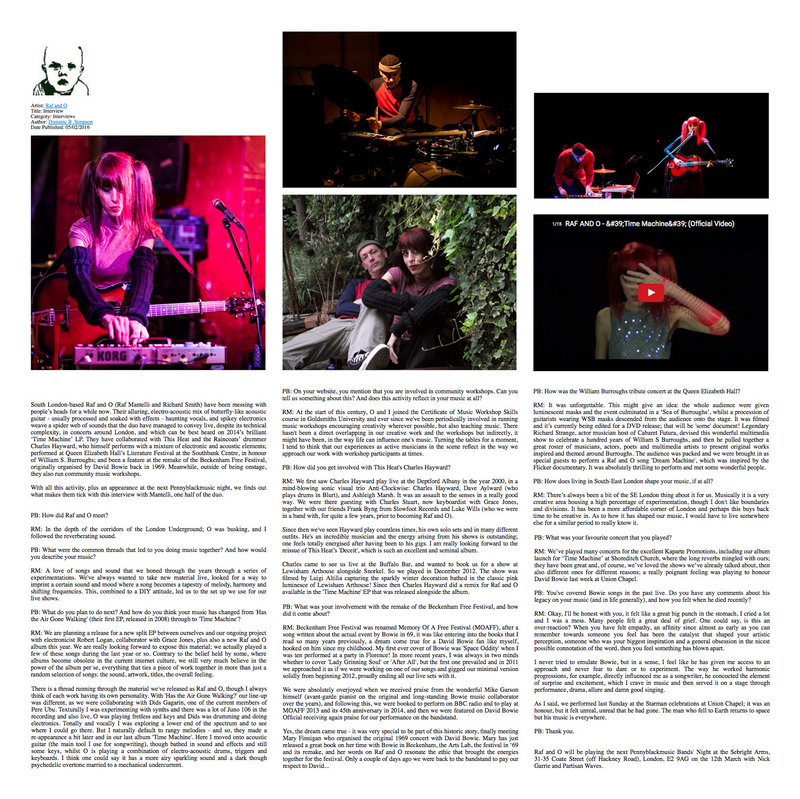 Here is a transcript from an interview I did with Dominic Simpson for Pennyblackmusic Magazine, as we are about to play Pennyblack first show of 2016. Find the full interview on the photo below. 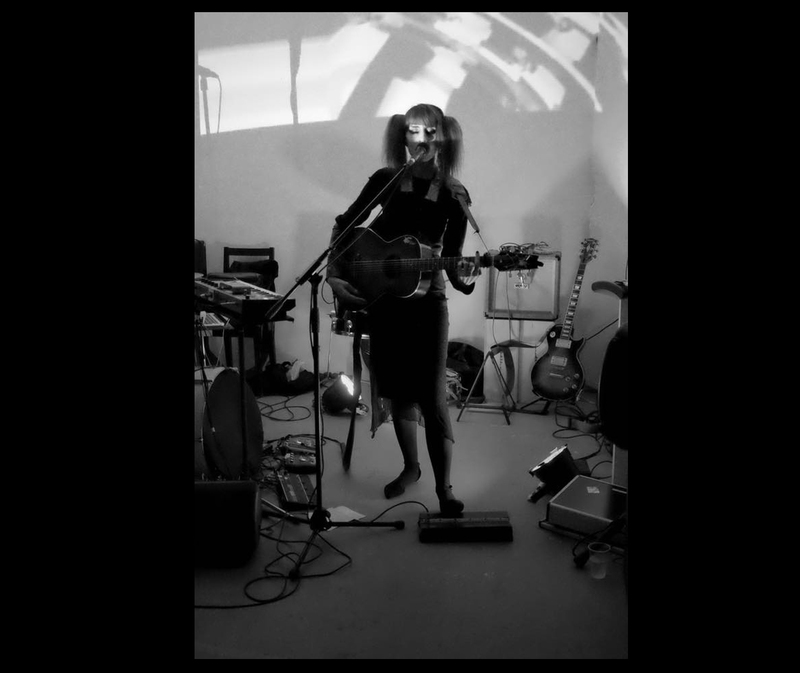 PB: You’ve covered Bowie songs in the past live. Do you have any comments about his legacy on your music (and in life generally), and how you felt when he died recently? RM: Okay, I’ll be honest with you, it felt like a great big punch in the stomach, I cried a lot and I was a mess. Many people felt a great deal of grief. One could say, is this an over-reaction? When you have felt empathy, an affinity since almost as early as you can remember towards someone you feel has been the catalyst that shaped your artistic perception, someone who was your biggest inspiration and a general obsession in the nicest possible connotation of the word, then you feel something has blown apart. I never tried to emulate Bowie, but in a sense, I feel like he has given me access to an approach and never fear to dare or to experiment. The way he worked harmonic progressions, for example, directly influenced me as a songwriter, he concocted the element of surprise and excitement, which I crave in music and then served it on a stage through performance, drama, allure and damn good singing. 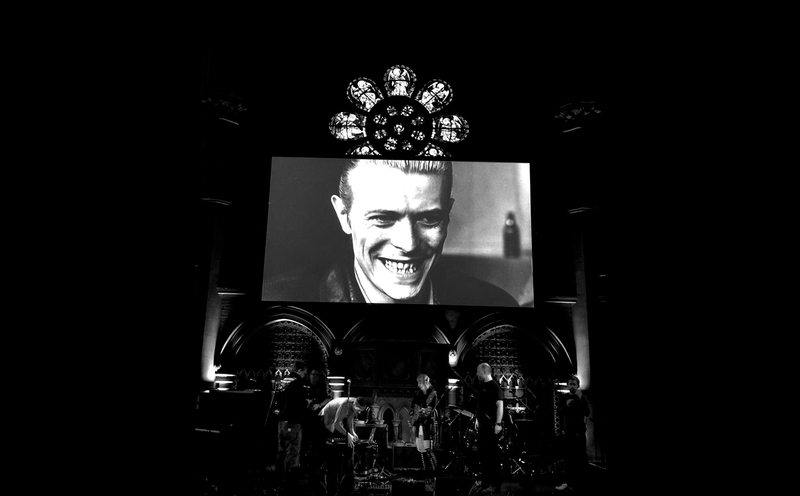 As I said, we performed last Sunday at the Starman celebrations at Union Chapel; it was an honour, but it felt unreal, unreal that he had gone. 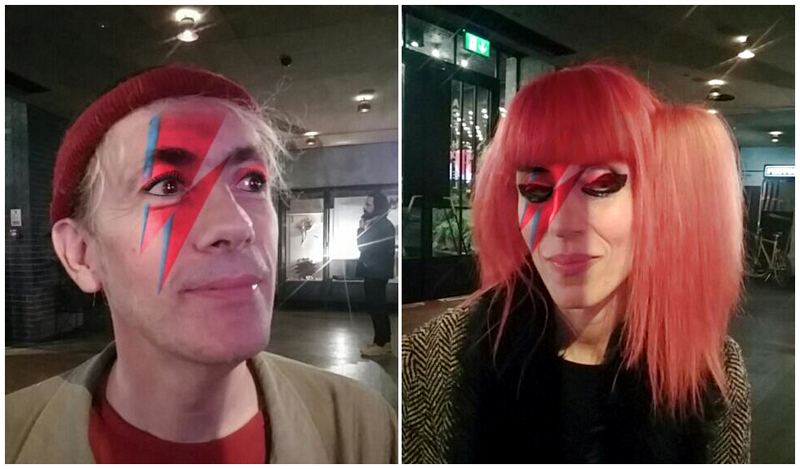 The man who fell to Earth returns to space but his music is everywhere. 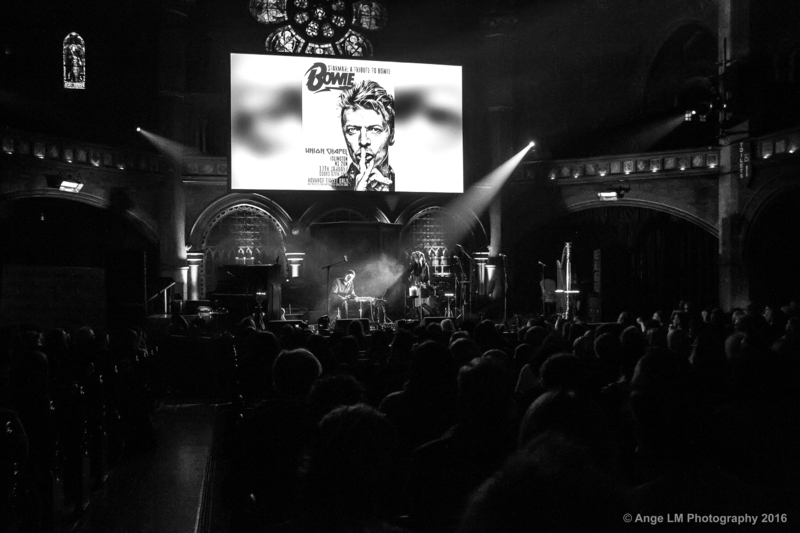 Raf and O live at Starman a celebration of David Bowie, Union Chapel. Photo by Ange LM. 2016 will see our follow-up to ‘Time Machine’, we are excited to soon be presenting our latest work. 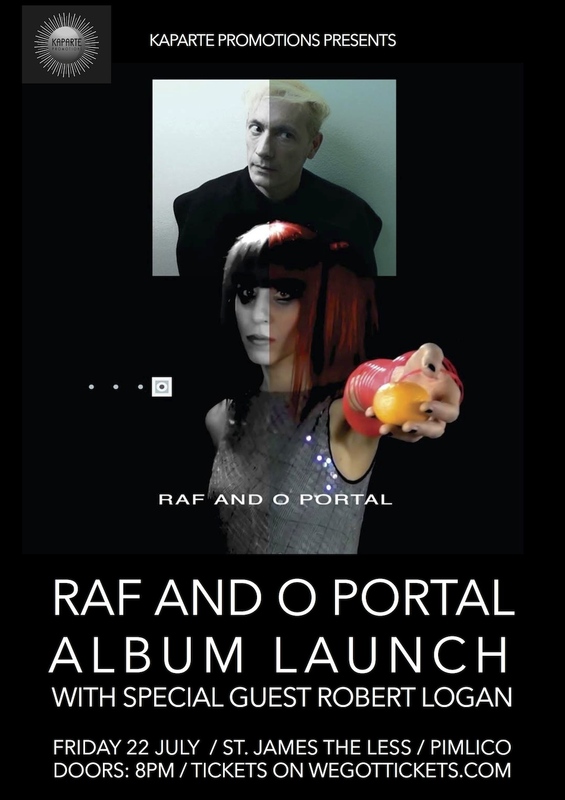 Raf and O‘s new album will be called ‘Portal’ featuring Shakespeare’s ‘Sonnet 62’ which we’ve set music to; a special edit preview was aired last Saturday on the Dexter Bentley show, Resonance FM. The album will also feature ‘Win’ our new take on Bowie’s classic from ‘Young Americans’. We recorded drum takes on January 10th…My heart sinks now when I think about the lyrics. 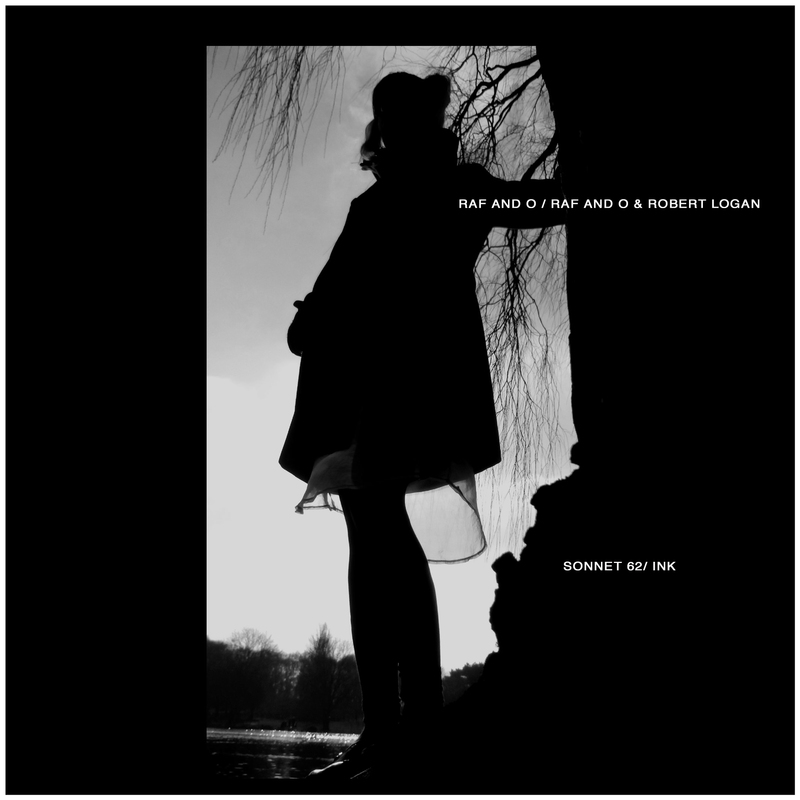 As well as this, we will unveil some of the work stemmed by our collaboration with electronicist and Grace Jones’ s collaborator, Robert Logan. This will be part of a split EP released between ourselves and our collaboration ahead of the album. Lots more to come on these fronts, we will keep you updated, but watch out for latest news on our Facebook page. 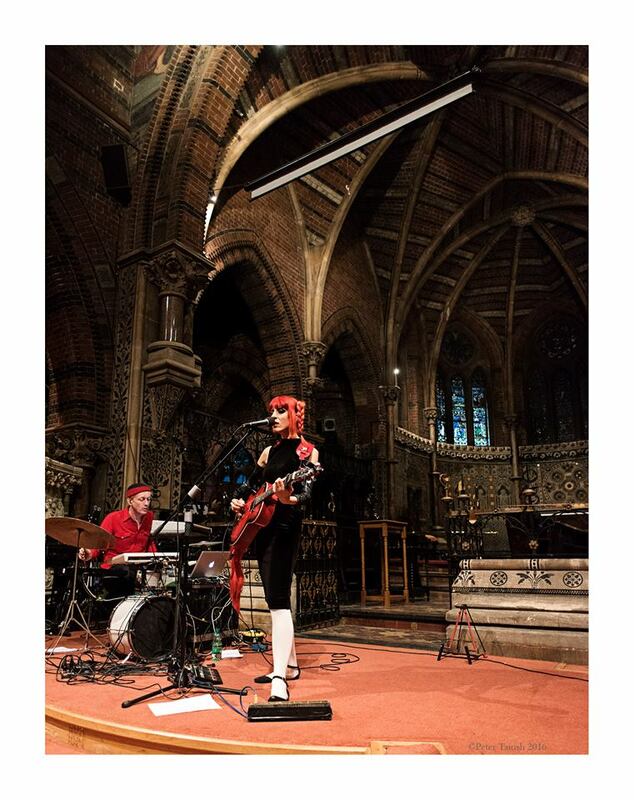 On the live front, as well as Union Chapel, we recently guested at a private party, having previously played at Whisper and Hurricanes and Kaparte Oxjam. “Most impressive were Raf and O, a talented avant-garde duo influenced by David Bowie but no copycat.” Psychedelic Suburbia, Mary Finnigan. Coming up shortly …some great gigs! Very much looking forward to March 12th, first Pennyblackmusic gig of 2016. Do join us, Raf and O support Nick Garrie, sixties British singer songwriter, at Sebright Arms, London. More details and TICKETS available HERE. 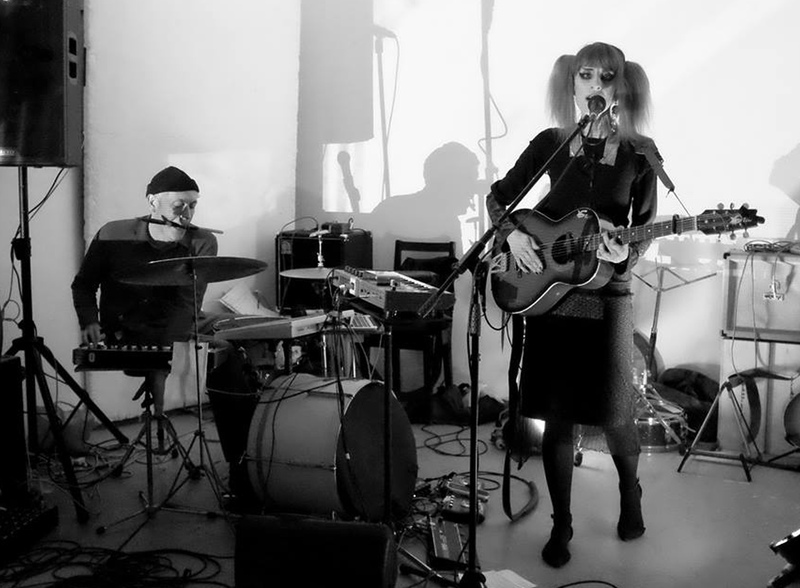 Raf and O live at the Apiary, June 2015 Photo by Philip Seargeant. It was one year this month since Richard Strange staged ‘Language Is A Virus From Outer Space’, a multimedia celebration of William S Burroughs at Queen Elizabeth Hall on the Southbank. 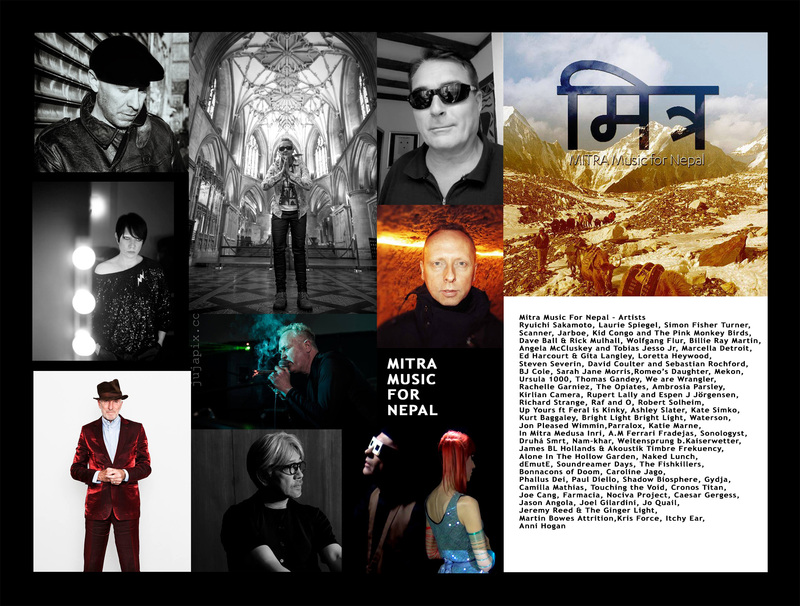 Mitra Music For Nepal is now released and as mentioned before Raf and O present a previously unreleased original track ‘With Fatzer’ (featuring piano/ vocals & electronics) alongside other artists and legends including, Sakamoto, Wolfang Flur, Scanner, The The, Nick Cave and Anni Hogan. Hogan, pianist extraordinaire and Marc Almond’s collaborator has painstakingly put together this wonderful project. Now you can get to hear it and if you haven’t bought the compilation yet, do it, you can get it here or many other digital outlets (all proceeds go to charity). Talking about timings, this coming Saturday (October 24th) we’re once again sharing a bill with Anni Hogan, also Autorotation and Robinplayschords (who we’ve recently remixed for his 12″ release ). Full line up and details on the live page and on the flyer below. Really looking forward to join all and return to the stylish settings of The Ivy House, a little gem on local ground, South London, a Kaparte Oxjam and a charity event, don’t miss! All details and tickets available here. 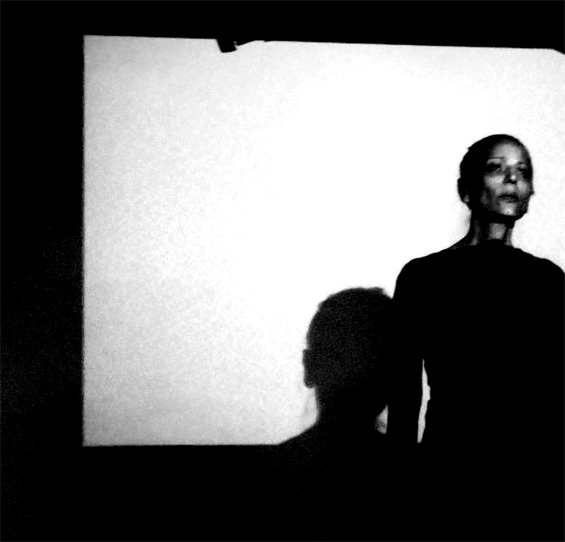 In summer we were commissioned to provide sound design and music for a new play, a tribute to Cocteau. 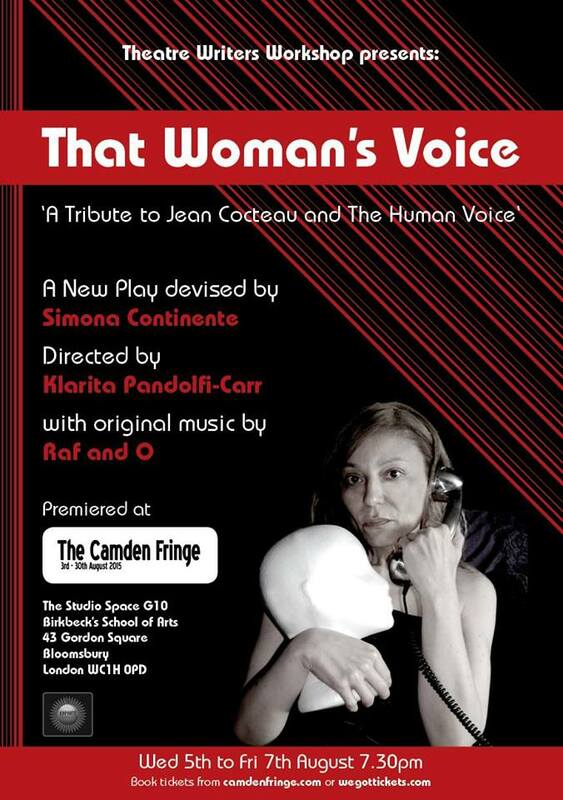 Premiered at Camden Fringe, ‘That Woman’s Voice’ was devised/ performed by Simona Continente and directed by Klarita Pandolfi Carr. O did the live tech and lights and together we wrote the music. It was a priviledge to be a part of the play and to imagine and externalise the inner turmoil of Simona’s character through sound and music. A great experience! Thanks to Scaledown for inviting us to perform last month, a really enjoyable night at the one and only King and Queen in the heart of London town. 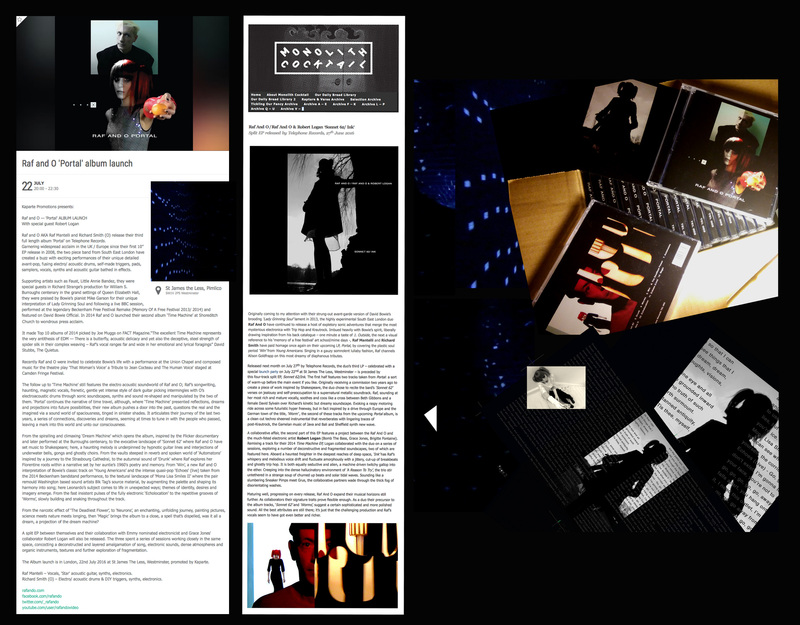 “Aesthetically stunning and sonically astounding ….it’s Raf and O.” Scaledown aka The Orchestra Pit. Londoners and South Londoners alike, get yourselves to The Ivy House this coming week-end! See you there! As warmer days stretch ahead, the golden evening shadows linger…….. we’re very honoured to be part of an extraordinary compilation to help the people of Nepal. Last year at Queen Elizabeth Hall ‘s Burroughs celebration, we shared the stage with the wonderful Anni Hogan; with Cathy O’Dowd, she has worked incredibly hard in putting together ‘Mitra Music for Nepal’ (Mitra means friends in Nepalese). Raf and O alongside other artists and legends including Ryuichi Sakamoto, Scanner, Steven Severin (Siouxie and the Banshees) , Wolfgang Flür (Kraftwerk), Anni Hogan herself, Martin Attrition, Richard Strange, Marcella Detroit, Billie Ray Martin, D. Coulter + Seb Rochford (see photo above for full list ) have contributed material to this release. Distributed by Sub Culture Records, it will be available 7th July, (here’s the FB Page ) please buy this unique release, all proceeds are going to the people of Nepal who need help to rebuild their world. The track we’ve chosen for the compilation, ‘With Fatzer’ (inspired by a WW1 unfinished play by Bertolt Brecht) is an early and previously unrealesed Raf and O song, performed last year, only for the second time ever on the grand piano at Shoreditch Church! Few more releases this summer also include RobinPlaysChords 12″ vinyl for Teardrop Girl-Star on Tiergarten, it features a Raf and O remix of ‘Mercurial Son, alongside Larsen’s Fabrizio Modonese Palumbo and it is out now plus, we have also been included in a new Ex Gratia Recordings live compilation ‘Beg Yr Pardon’. Raf and O have been commissioned to create new musical work and sound design for this year’s Camden Fringe, a very exciting project! On the live front, a big thanks to Klarita Kaparte, Metamono and David Stubbs (DJ). A superb analogue fest from Metamono and a brilliant set from DJ Stubbs that included Bowie, Eno, Faust, Kraftwerk; Raf and O had a smashing time airing a new song, ‘Neurons’ plus a latest David Bowie fix! Yes, our version of ‘Win’ from ‘Young Americans’. Very grateful for such buoyant support from the audience! And last…overcoming a bumpy start to the month of June that made it impossible to play (!) we are now back on track, in time to join Raagnagrok and the fine Rude Mechanicals who have invited us to take part at their ‘Child Be Strange II’ show at the Apiary Studios, London. We’re very much looking forward to perform again, come celebrate with us all things summer, all things strange, all things and feeling renewed – at the Apiary. 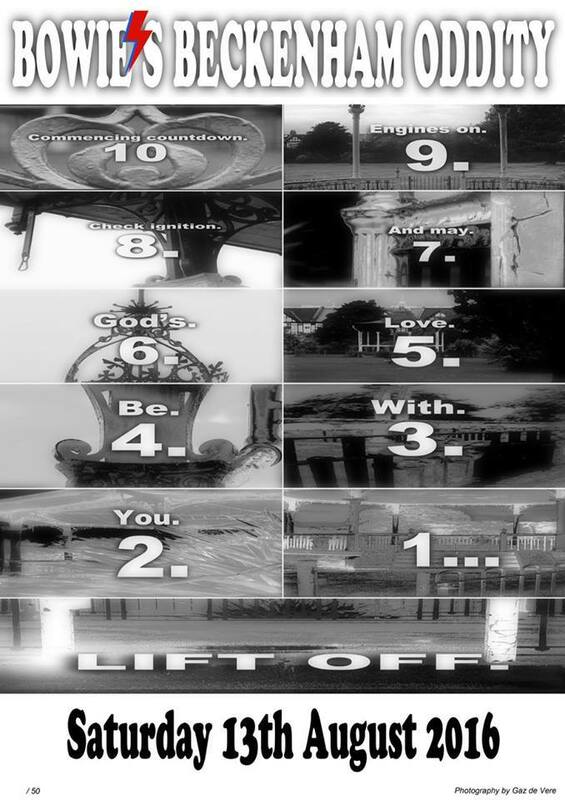 Only ten days away … Countdown! 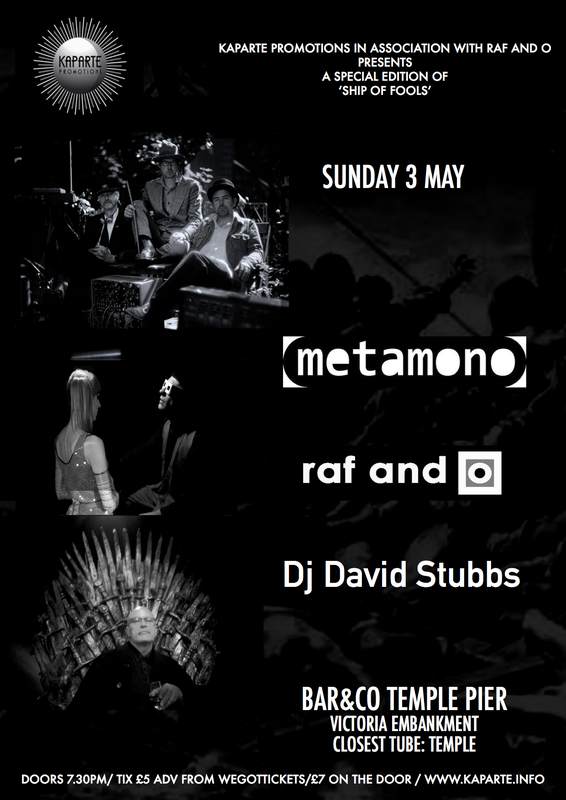 Raf and O in association with Kaparte proudly presents a very special event at the Ship Of Fools, London, May 3rd, featuring live sets from Metamono, Raf and O and David Stubbs will be our very special guest DJ! Needless to say we are very excited to be performing at this wonderful bill! Metamono are a band who make beautifully pure analogue electronic music with a unique manifesto. 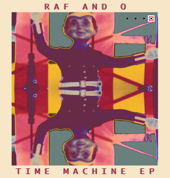 Head honcho Jono Podmore had already lent his excellent sonic contribution remixing Raf and O on the Time Machine EP under the guise of Kumo, which was released March last year. We are very honoured to have the legendary music journalist David Stubbs on board this night as a special guest DJ, David has supported us on numerous occasions since he first came to see us performing at Memory Of A Free Festival and reviewed our album last year for the Quietus. All is happening at Klarita Kaparte’s beloved boat with wonderful views of the Thames! Setting sonic sails, there will be lots of live music to float and to throb to, plus we’ll all be voyaging through analogue, krautrock, electro, Bowie and more!! Thanks to John Flashbulb Goode for capturing the event. See photo below. 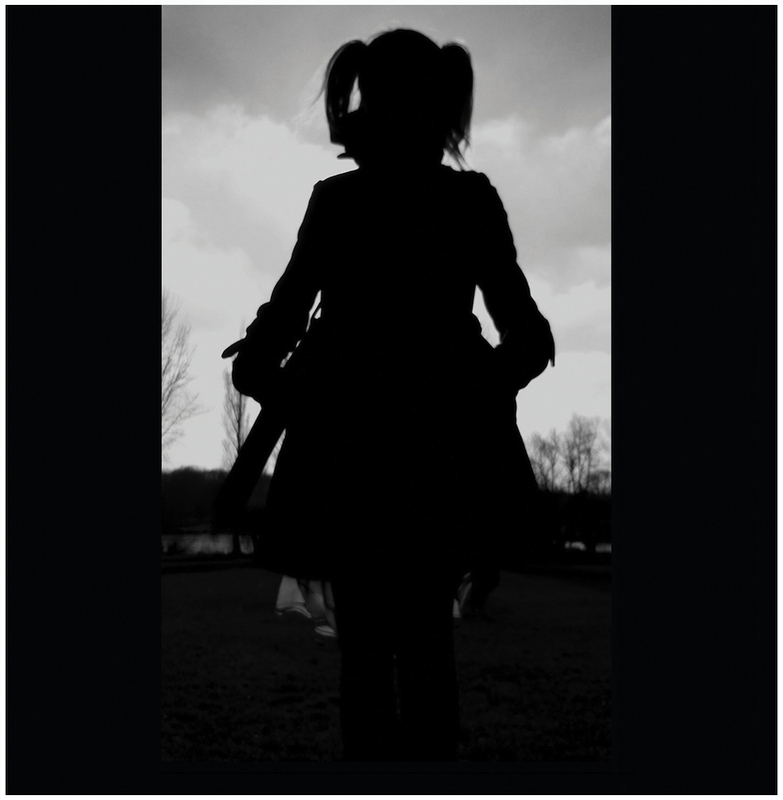 Other news includes our contribution to this year’s Sonic Circuit, Queering Sound, running this June in Washington DC and RobinPlaysChords 12” vinyl, which features a Raf and O Remix, is now in production. See you on May 3rd!